In addition to his art practice, Gordon Huether has extensive experience consulting and collaborating with civic, business and community leaders in developing municipal master plans, public art policies and integrating art into private development. 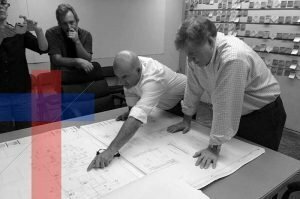 Having worked closely with developers, architects, community representatives, government agencies, artists, and design and project teams throughout his career, Gordon is uniquely qualified to support and help facilitate the successful completion of any of number of private or public projects, from initial concept through completion. As Chairman and member of the City of Napa’s Planning Commission for more than a decade, Gordon has worked extensively with the City to transform Napa’s urban center into a thriving and desirable gathering space. For the City of Chico, CA, Gordon worked with the Planning Commission to develop the Chico Functional Aesthetic Treatment Plan, an integrated public art plan that has helped established Chico’s lively and fashionable downtown. Gordon is currently participating in an exciting ongoing collaboration with the Salt Lake City Department of Aviation and HOK Architects in the development and construction of a major three-level terminal at the Salt Lake City International Airport. Huether’s large-scale integrated artwork will be the featured throughout the main terminal concourse, and concurrently, Gordon is developing a Master Art Plan for the airport, including curating the airport’s current art collection and commissioning new artwork for the space. As an art consultant, member of juried art selection panels or a project development collaborator, Gordon brings a unique and valuable perspective to a wide array of projects. A frequent lecturer on the topics of art in architecture, the challenges of integrating art in airports and the spiritual in art, Gordon’s vision and sensibilities are valued added to every project.